Lanna’s Grade Four class hunts for treasure! To provide an opportunity for its students to exchange and learn local cultures, Prem International School arranged the “Ban Tham and Prem Center Cultural Exchange Program” on September 26, when local students from Ban Tham school in Chiang Dao district joined Prem’s students for activities. The cultural exchange program was initiated by Canadian teacher, Randall Haime, and Stuart Cavaliero, the proprietor of Chiang Dao Nest Resort in Chiang Dao district, who also teaches English to students of Ban Tham School. The two invited 19 Phrathom 6 (Grade 6) students from Ban Tham School and two teachers to join the activities at Prem Center. In the morning session, six senior students, Kannan Punedran, Jaime Peske, Jessie Ryan, Kylie Nealis, Yui Ratioran, and Kien Tran joined Prem students in dodge-ball and football at Prem’s gymnasium and football field. Students were divided into groups to take turns to play each game, which they seemed to enjoy. After a short rest, they moved on to practical English lessons which taught them how to ask common questions such as “What is your name?”, “How old are you?” and “What do you like?” Senior Prem students escorted the students and helped with the lessons. The most enjoyable time for all of them followed, with activities poolside before lunch which was held at Prem’s cafeteria. Yes we are having fun. In the afternoon, the cultural exchange program began with Ban Tham School’s students and teachers demonstrating how to make krathongs from banana leaves (very useful with Loy Krathong coming up). Randall Haime said the main purpose of the program was to promote a cultural exchange as most of the Ban Tham students were from hill tribes, while those from Prem came from overseas such as Malaysia, Vietnam, Australia, America and Canada. He hoped that all the students had enjoyed the activities and learnt something useful. “In future, we plan to arrange these kind of activities in Chiang Dao district as well to further strengthen relationships between our students and those of Ban Tham School,” said Randall Haime. “This was not the first time we have carried out activities in collaboration with local Thai students. 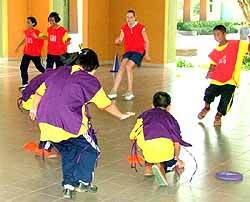 We have done so with many local schools both in Mae Rim and Chiang Mai city. These activities are part of the CAS (Creativity, Action and Service) Program, which required students to serve the local community,” he said. Stuart Cavaliero expressed his appreciation of the program to help rural students learn and gather new life experiences. The German Academic Exchange Service (DAAD) has informed Chiangmai Mail that the deadline for applying for scholarships in Germany is October 15, 2004. In addition to its traditional programs, DAAD has established a new scholarship program for doctoral research. Called the Sandwich System, a joint supervision research model is a flexible scholarship system, providing financial assistance for doctoral research in Germany as well as mutual visits by the academic supervisors. The final doctoral examination takes place in the candidate’s home country. Although the DAAD does place a greater emphasis on the applicant’s academic qualifications than on their German language skills, applicants will nevertheless be expected to take every opportunity to gain and improve their knowledge of German whilst still in the home country. A monthly installment scholarship is paid. Its level is based on the scholarship holder’s level of qualification (as a rule approx. 35,000 – 47, 000 baht) plus tuition fees in accordance with the applicant’s academic standing. The two international houses have been built at Mae Fah Luang University Chiang Rai, with Pol Gen Pao Sarasin, the president of the university, presiding over the ceremony. The buildings will be used for Sirindhorn Chinese Language and Cultural Center activities in the campus, with assistant professor Pritana Pratheepasen, deputy rector of the university saying that these dormitories were supported by Chinese government which also donated study materials and equipment for the courses. Apart from this, the Chinese government also sent its experts to help develop the course curriculum, as well as being lecturers for Chinese language courses. Other donations towards the international houses came from Prasert and Tassanee Pungkumarn and Anant Assawaphokin. These donations were presented through HRH Princess Maha Chakri Sirindhorn for use in the university construction projects when she visited the university on February 3, this year. In September, my students, my assistant teacher, Julie, and some parents took a morning trip to Krisda Doi, a beautiful Garden Resort on the Samoeng Road. We began our day with a scavenger hunt, and in teams, the students spread out and found some beautiful treasures. They had to collect various types of leaves, thorns, pine cones, different color petals and other interesting items. The rain sprinkled on us but it didn’t dampen the children’s spirits. They hunted with enthusiasm and were able to find many treasures without disturbing the gardens. We followed with a sketching session where the students had to find the four types of leaves we learned about, and some various types of plants. Once they found them they had to sketch them which was not too difficult with a partner and an umbrella to help. The rain stopped for our picnic lunch, which we thought was very considerate of Mother Nature. After finishing our lunch we cleaned up and just had time for a little play before the rain started again and we ran for the buses. We headed back to Lanna with bags full of nature’s treasures and some beautiful memories. Admissions officers from colleges and universities all over the United States have visited Prem to give students information about their institutions and the US college selection process. The event was attended by grade eleven and twelve Prem students as well as those from other schools in the Chiang Mai area. Admissions officer Lisa Bolick describes the opportunities available at Lynn University to Latoyah Trindade and Sarah Inta. Everyone loves a great success story, especially if that story is unfolding in your own backyard. The residents of Chiang Mai can now make such a claim. Throughout its rich history, Chiang Mai has become a city recognized for many achievements. However, a misconception in Thailand is that quality television programs can only be produced in Bangkok. One television show in particular is now working to change that. A new media production is making waves and carving out a good reputation for itself, and Chiang Mai for that matter. Sarah, Pun Pun, Tan, Champ and Nan, the stars of ‘Kids Only’ - our locally made TV show that impacts on Thailand in a great way. To find out more, tune in - with your kids - to TV Channel 11 every Wednesday, when the new hit television show, “Kids Only”, airs at 5.30 p.m. Since its launch on January 7, “Kids Only” has attracted Thai audiences topping at 1.6 million. These are impressive numbers for a program that is produced, start to finish, right here in Chiang Mai by CBN Siam. This energetic program is making a positive impact on children. Each week “Kids Only” tackles topics that range from music appreciation and culture, to more serious issues such as how to deal with loss. The program is hosted by five talented young stars who present these issues in a way that is both fun and accessible for children. The cast, ranging in age from 10-18, is quickly gaining popularity and national recognition. In fact, they are currently featured on the front cover of the popular national magazine, Teen Life. Although Thailand is quickly taking notice of this exciting new program and its stars, everyone involved at “Kids Only” desires to maintain a focus to enrich the community of Chiang Mai and produce quality programs, to reach out to the local community. Since early August, the young presenters have been touring schools in the Chiang Mai area, meeting children face to face, and sharing positive values in a series of live performances. This month, they will invite fans from Chiang Mai to participate in the fun of learning about the media and getting to know the hosts in a “Kids Only” mini-workshop. School students may apply for various classes, from acting, dancing, creative thinking to developing communication skills. When many parents complain about the lack of role models in the media, it is refreshing to learn that viewers of “Kids Only” now have five. Whether engaging viewers across the nation or reaching out to the children right here in Chiang Mai, “Kids only”, is a proven asset to its community. CMIS was the venue for the inter-school table tennis tournament last Saturday. 40 students from Chiang Mai International School (CMIS), Lanna International School (LIST), Prem and Nakhorn Payap International School (NIS) competed in the CMIS auditorium hoping to claim the title of the best ping-pong team. The competition was divided into the categories of girls open, boys 12-14 years and boys 15-18. The auditorium was filled with students wanting to play plus their parents who took many photographs of their rising ‘stars’.